Just one week ago I was far, far away in a fairy-tale land. 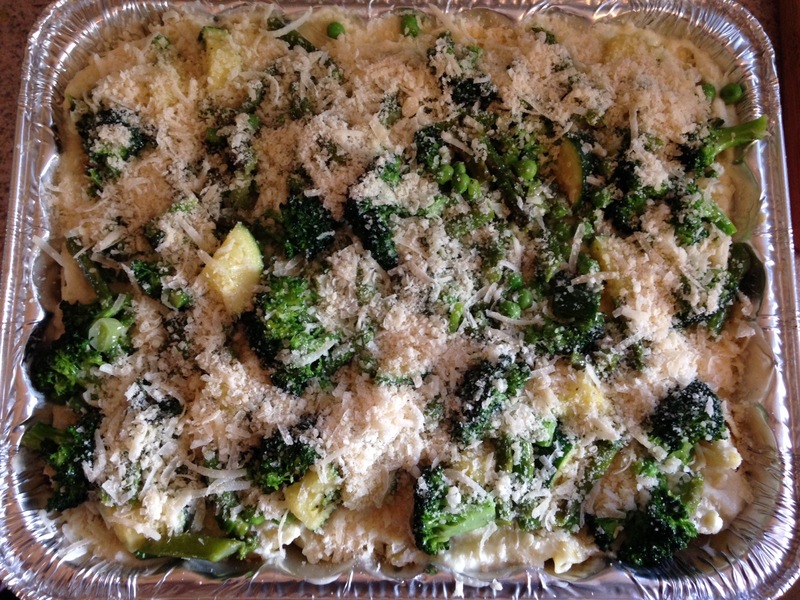 A place where eating pasta twice a day is not only accepted but expected. A land of corner cafes and breakfast pastries and gelato galore. 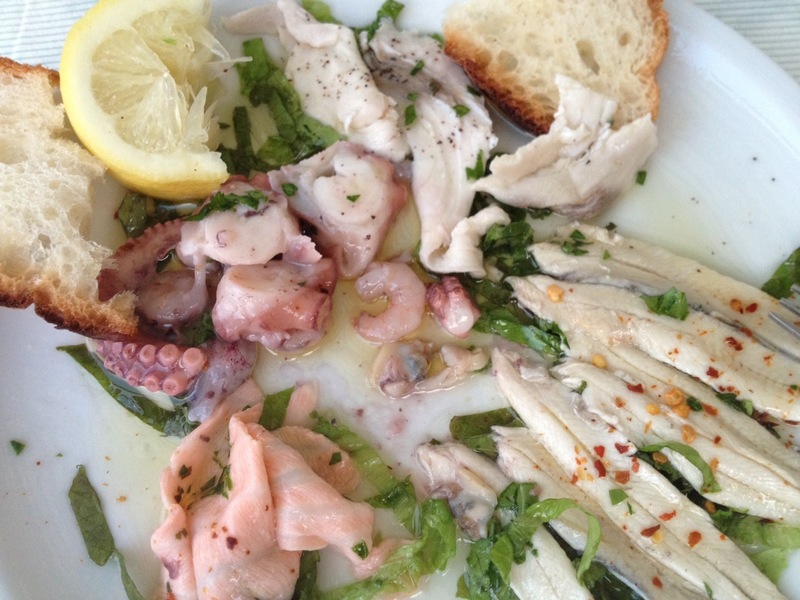 A country that romanced me through fluffy carbs and fresh seafood, wooing me to never leave. Here’s the full story. 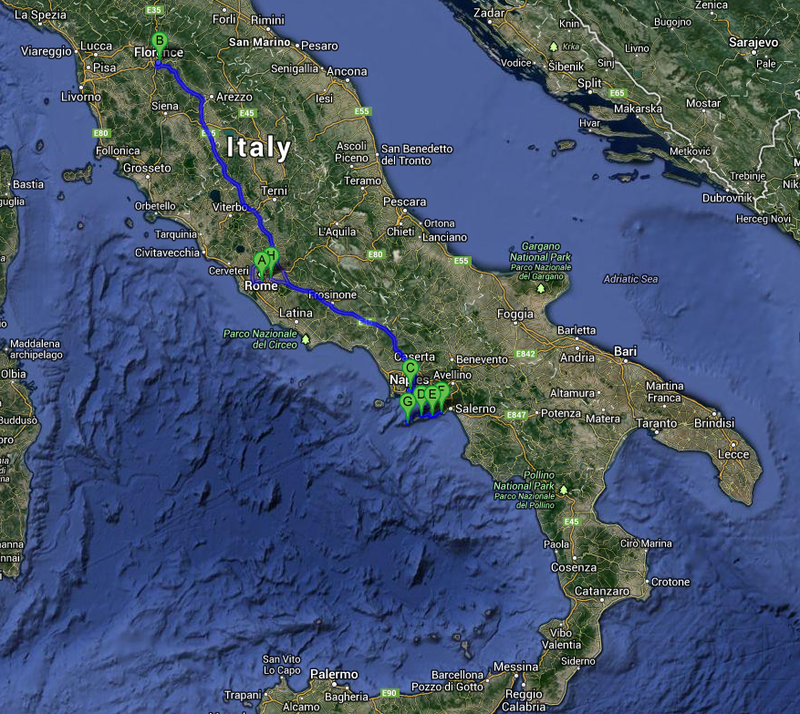 The Journey: Rome to Florence to Naples to Sorrento to Positano to Amalfi to Capri to Rome. Whew. 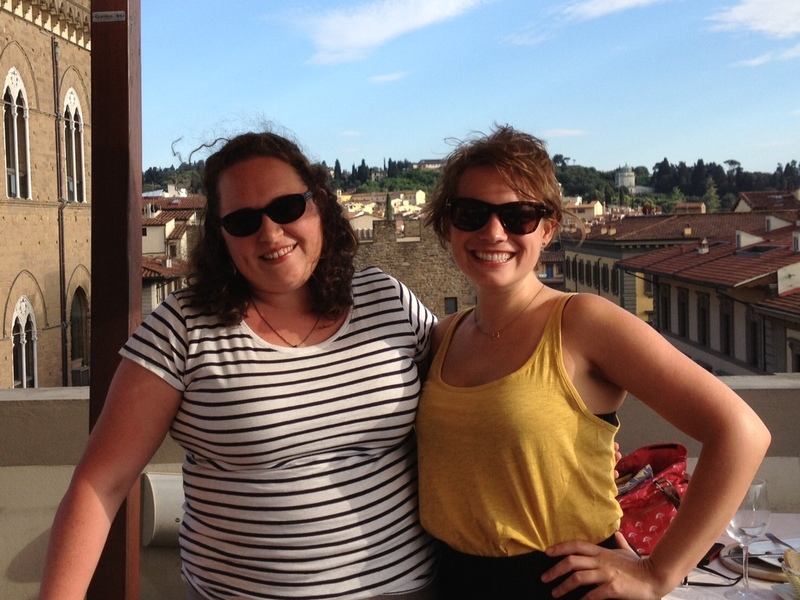 The Partner in Crime: Caroline and I in Florence taking in the views from a rooftop cafe. 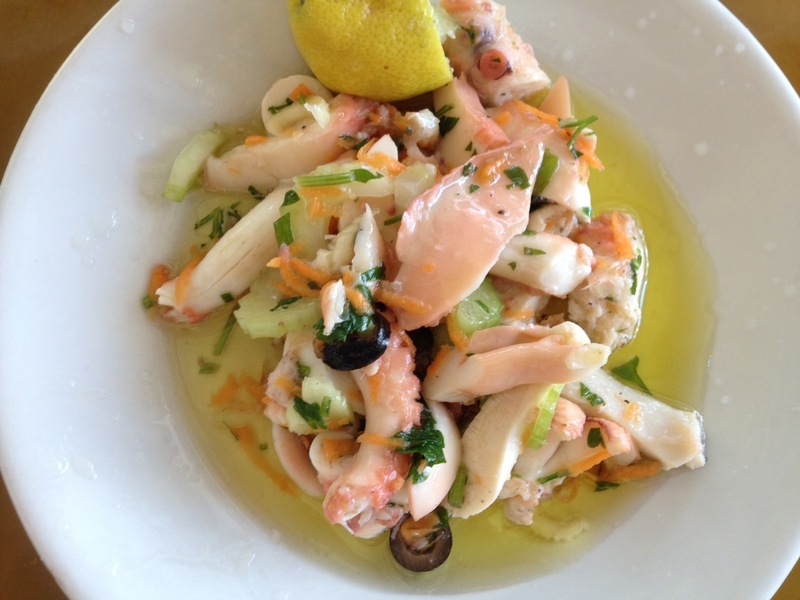 My lunch upon arriving in Rome: the first of many mixed seafood salads. I gazed at some ancient fountain while I ate this. But you don’t care about seeing that, do you? 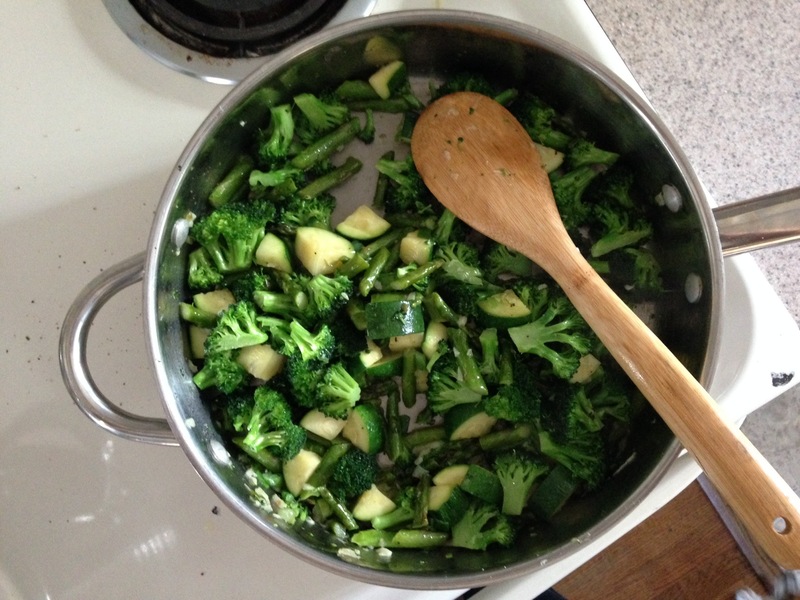 Dinner that night was on my own. 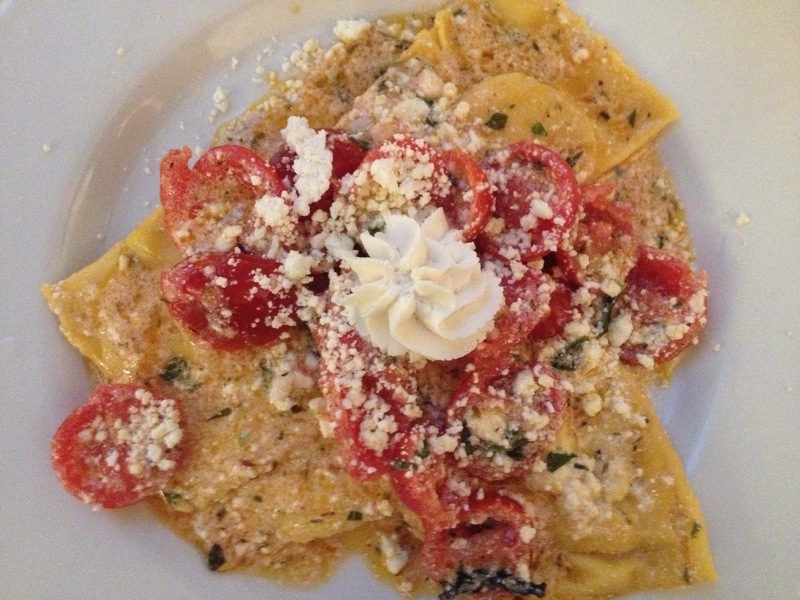 The hotel recommended a little trattoria around the corner called Antica Boheme. 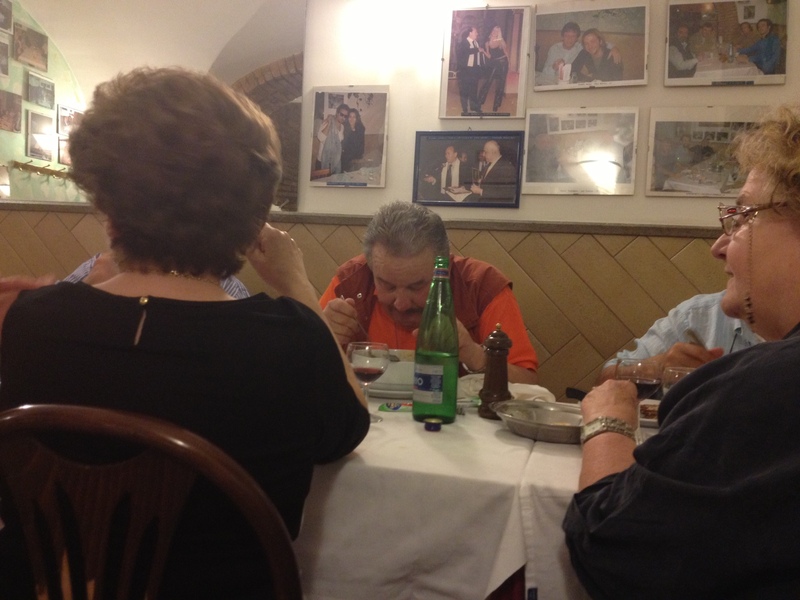 I was seated next to a table of six locals, only one of whom barely spoke English. It wasn’t this man, but he insisted that we communicate. He also insisted that I order the carbonara. So I did. By the end of the night we were such good friends that we were all sitting at the same table and they paid for my dinner. I love Italians. 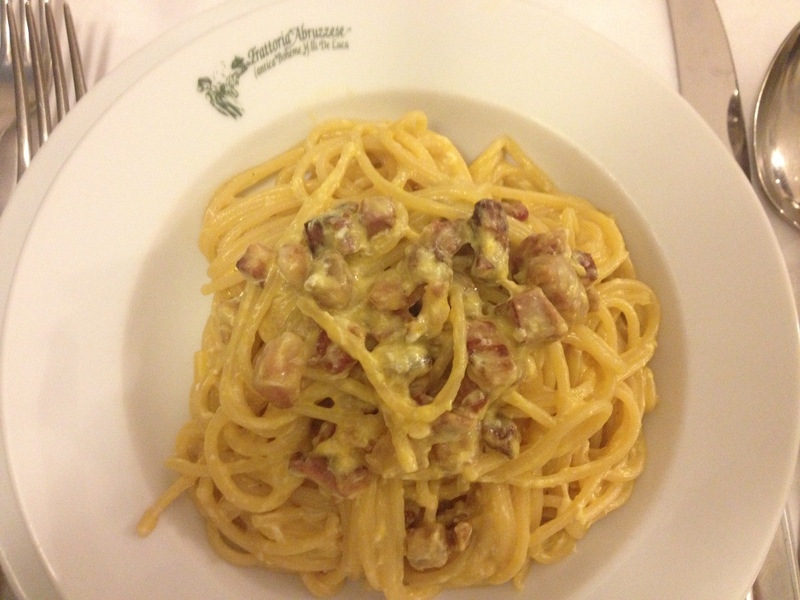 First pasta in Italy: carbonara. The Italian version of bacon is much more like country ham, FYI. 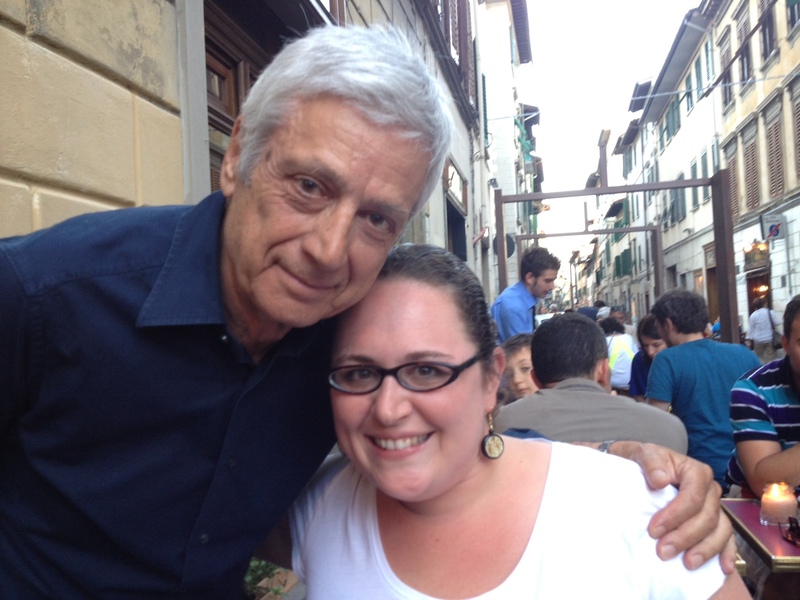 After meeting up with Caroline in Florence, we had an epic dinner. 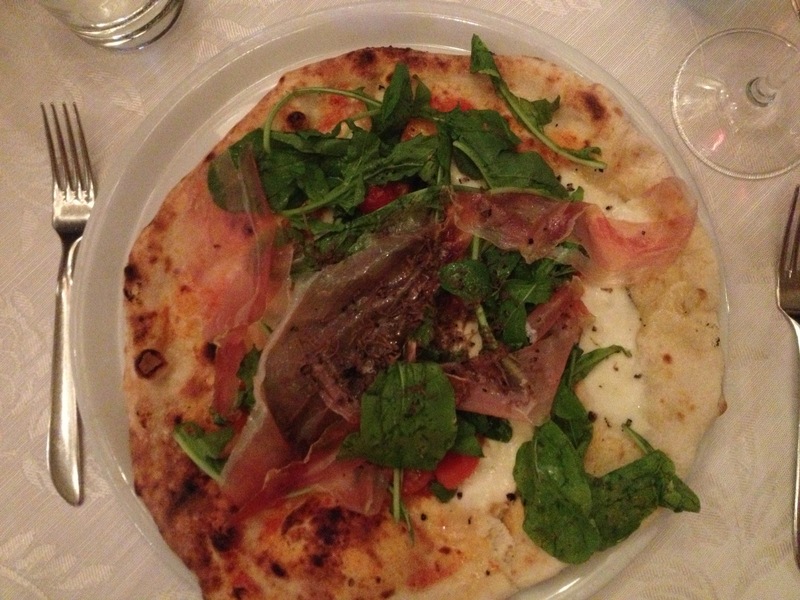 Epic because I ate this entire pizza topped with prosciutto, arugula, and fresh mozzarella. 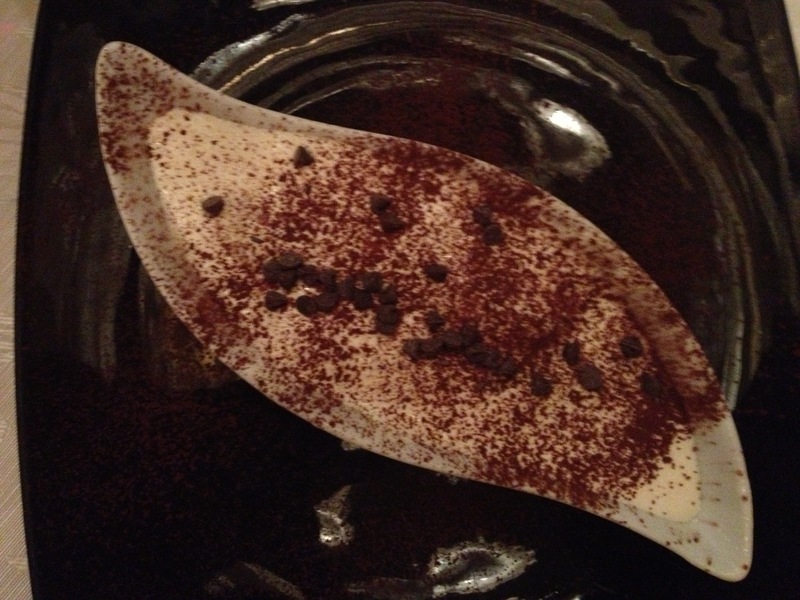 And then I ate this entire tiramisù. I have no shame. 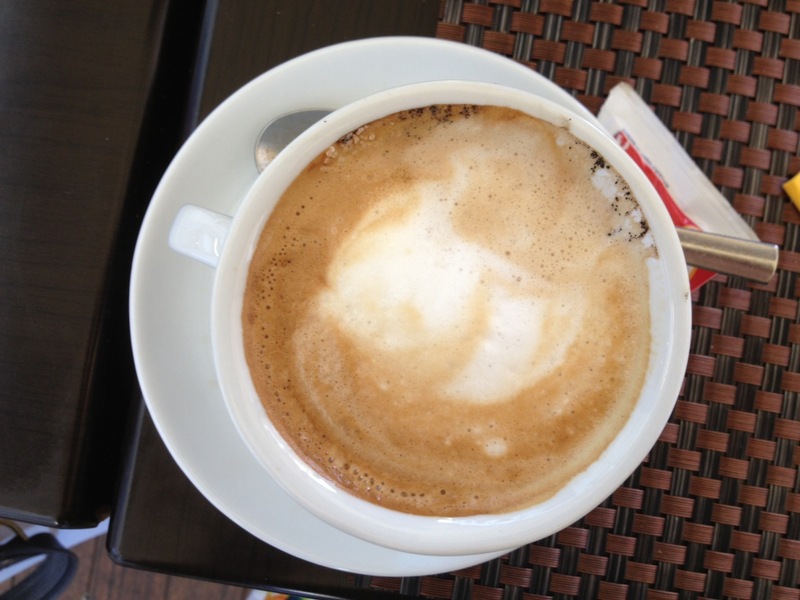 After a late night, we started the next day with coffees at Il Porcospino. One of the waiters has friends in Arkansas and even called the hogs for us. Small world. 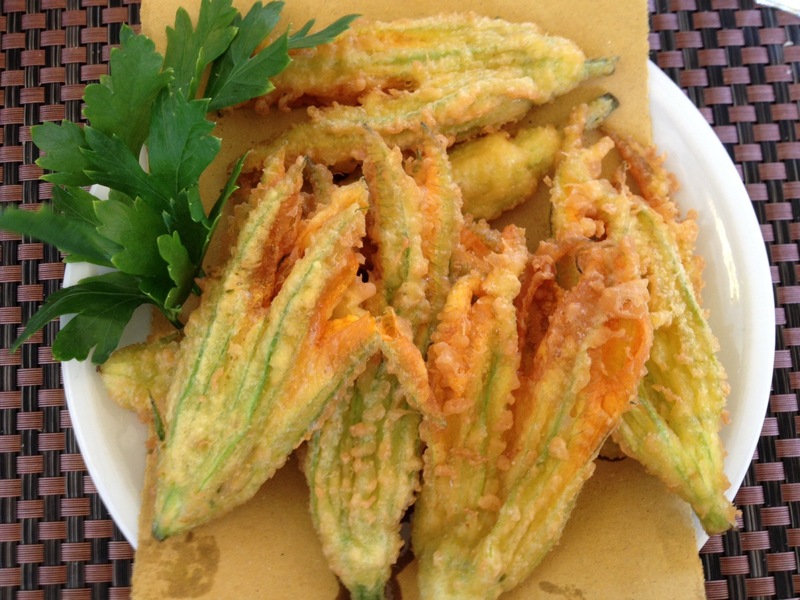 Then he told me I would have the fried squash blossoms. So I did. 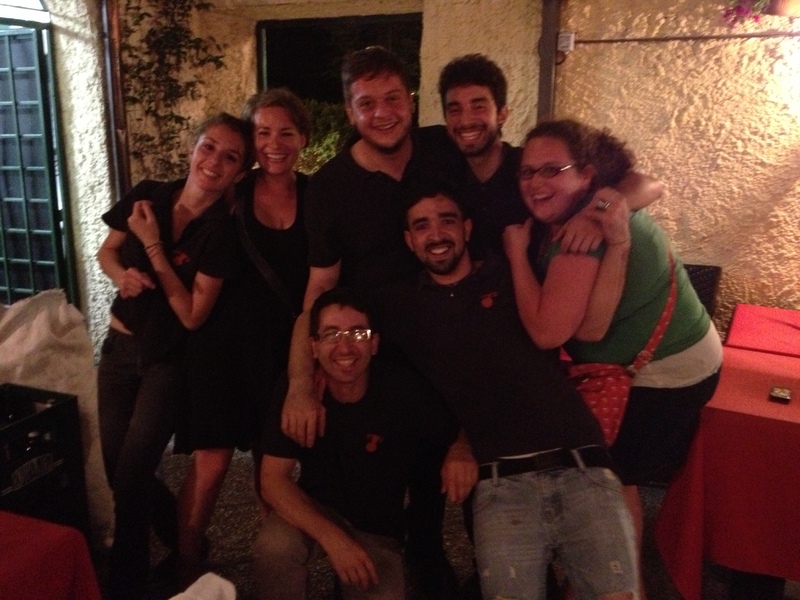 That night we had a traditional Tuscan meal at Trattoria Cibreo. AKA there was no pasta on the menu. But this sweet server steered us in the right direction. He also told us that he was once in love with a girl from Tennessee. 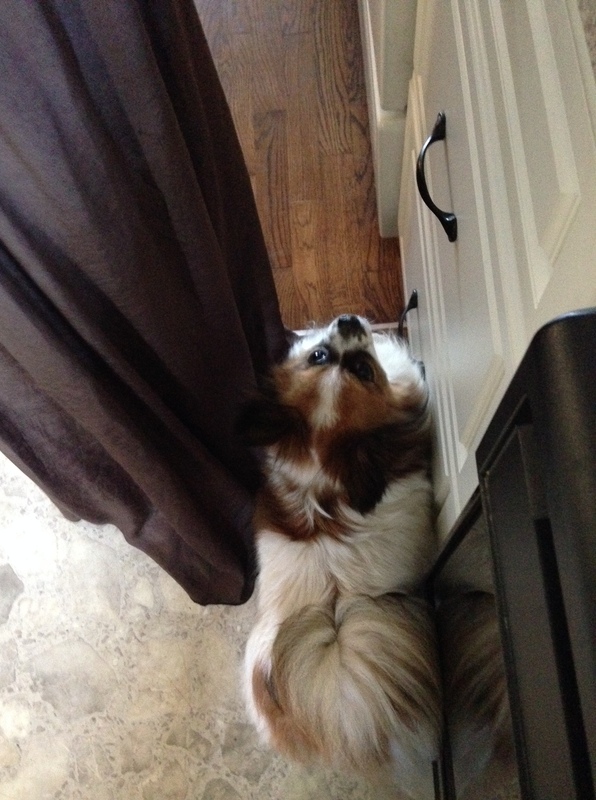 How precious. 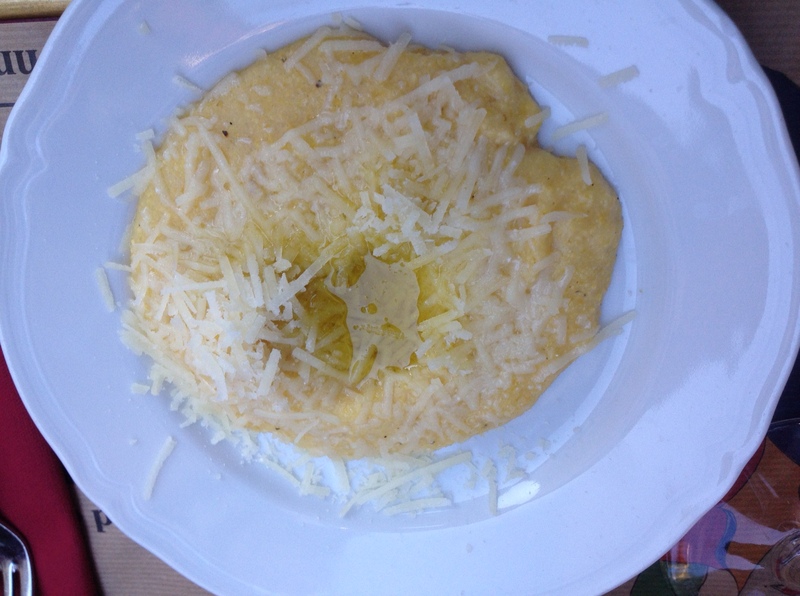 We started with the most incredible polenta I have ever eaten. 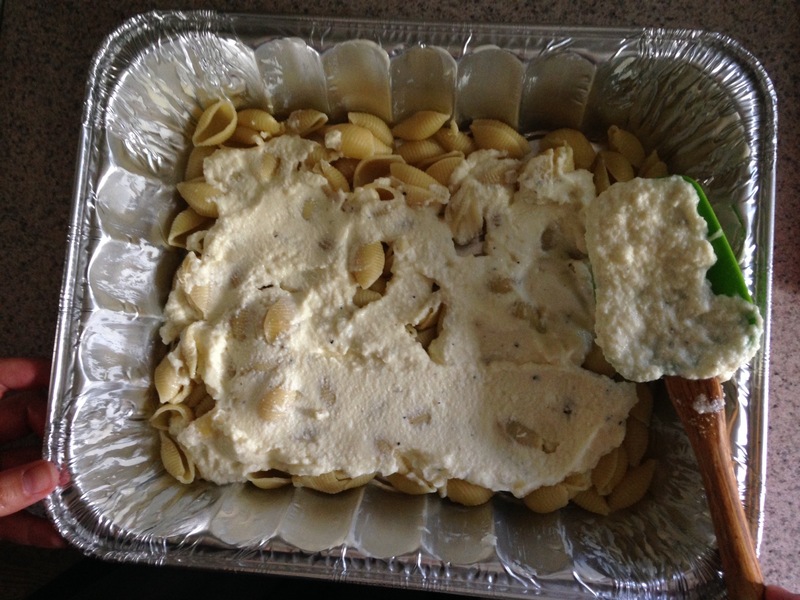 It was creamy and oily and salty and cheesy. 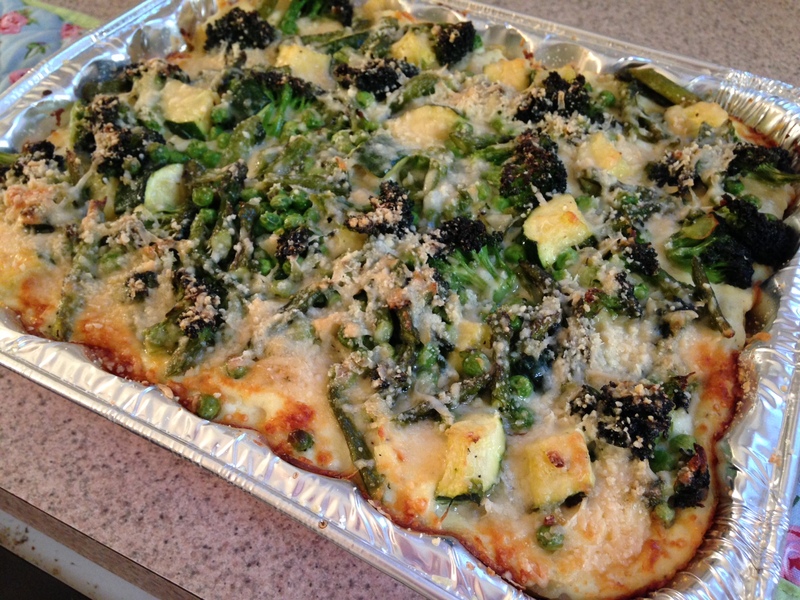 Just look at all that parmesan. 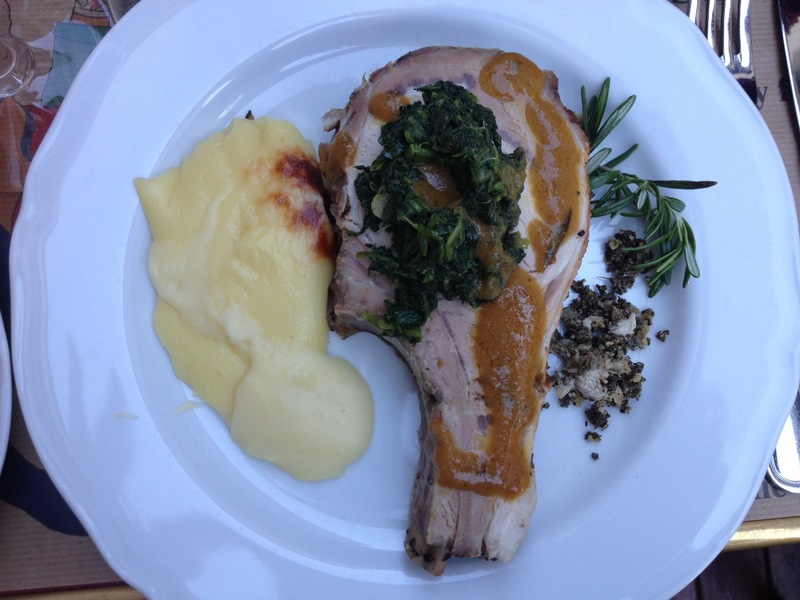 Then I had this pork chop that was stuffed with a rosemary concoction. 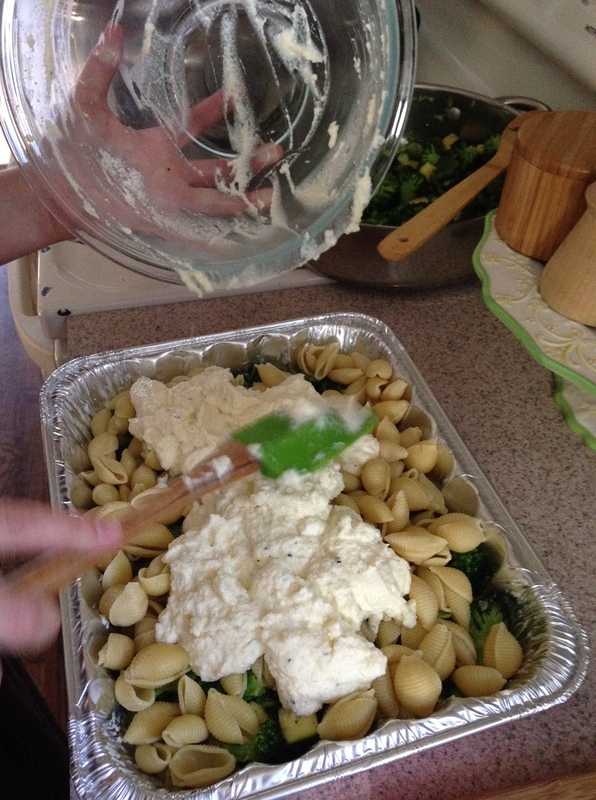 And those creamy potatoes were divine. DIVINE I tell you. 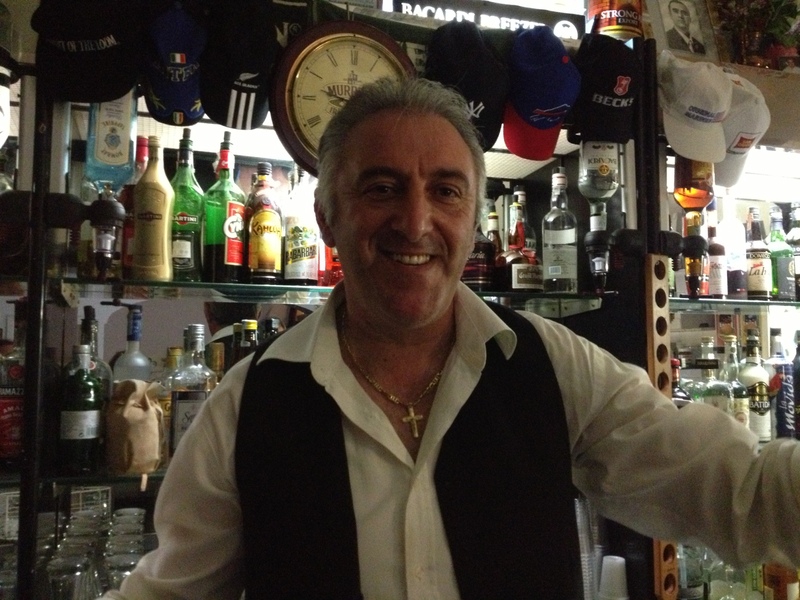 If you are ever in Florence, I highly recommend this little eatery. 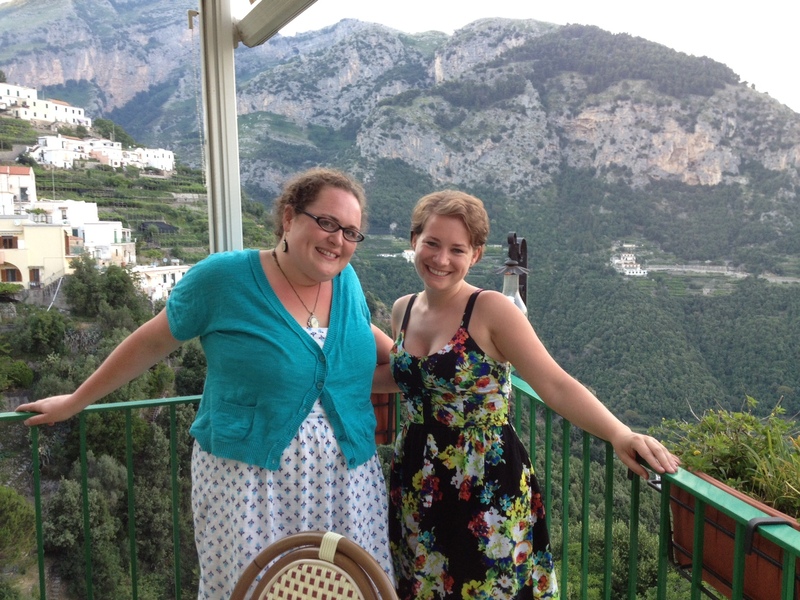 The next day we were on to the Amalfi Coast. No place is more beautiful. 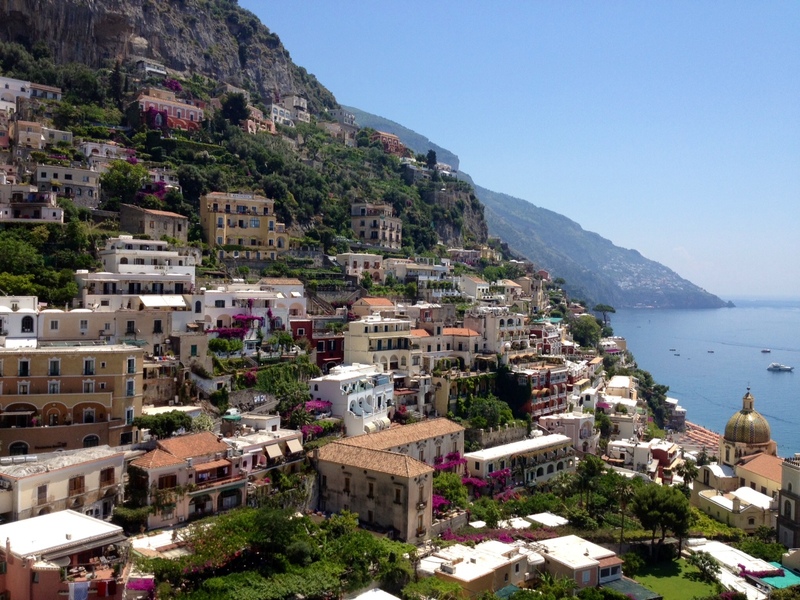 This was taken in Positano, just a bus ride away from our hotel in Sorrento. 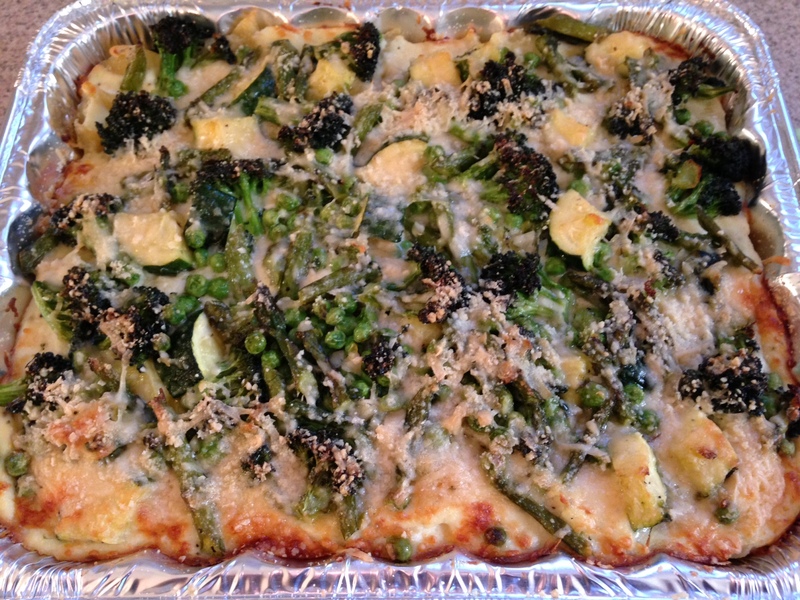 This day also happened to be Caroline’s birthday, so we decided to celebrate with—what else—dinner. 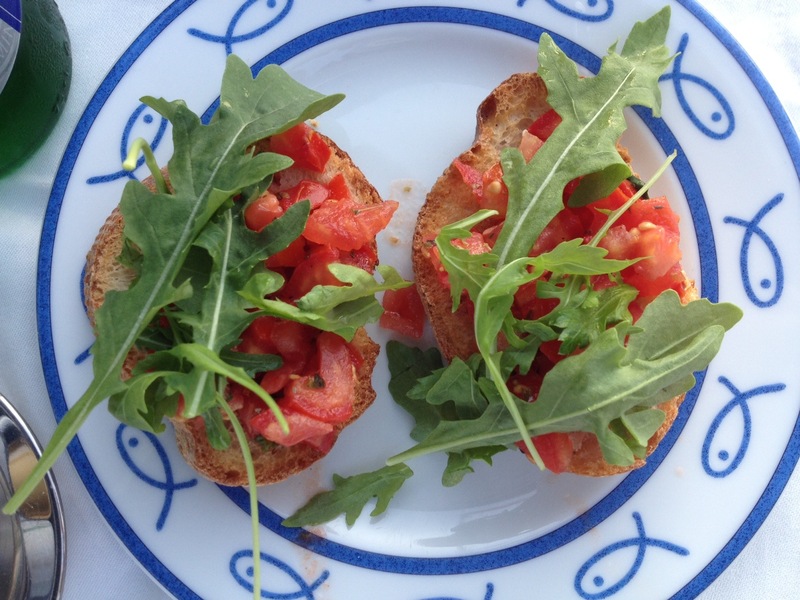 Ristorante Bagni Delfino in Sorrento started us off with the best bruschetta I’ve ever had. Seriously. 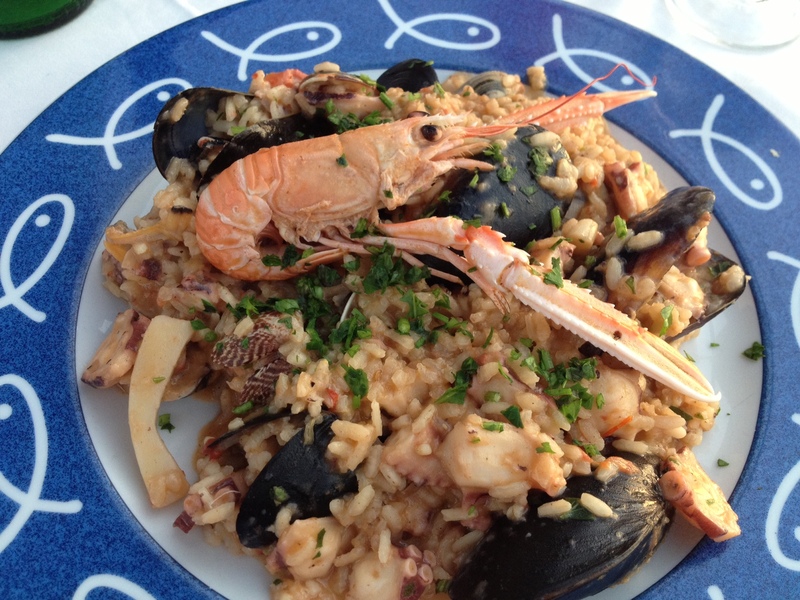 My main course was a seafood risotto that was looking back at me, but I didn’t mind. I ate every bite. 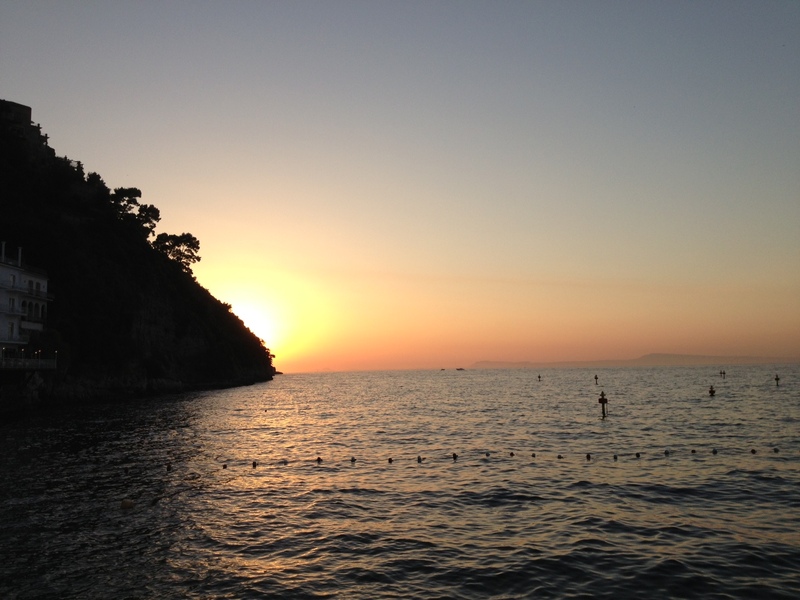 We finished our meal watching the sunset into the Tyrrhenian Sea. 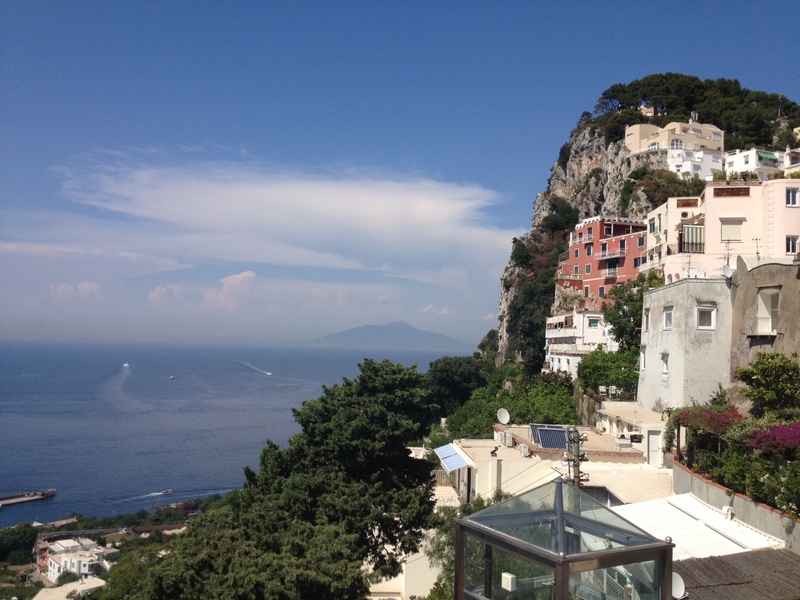 The next day we stopped for lunch in Positano at Buca di Bacco. 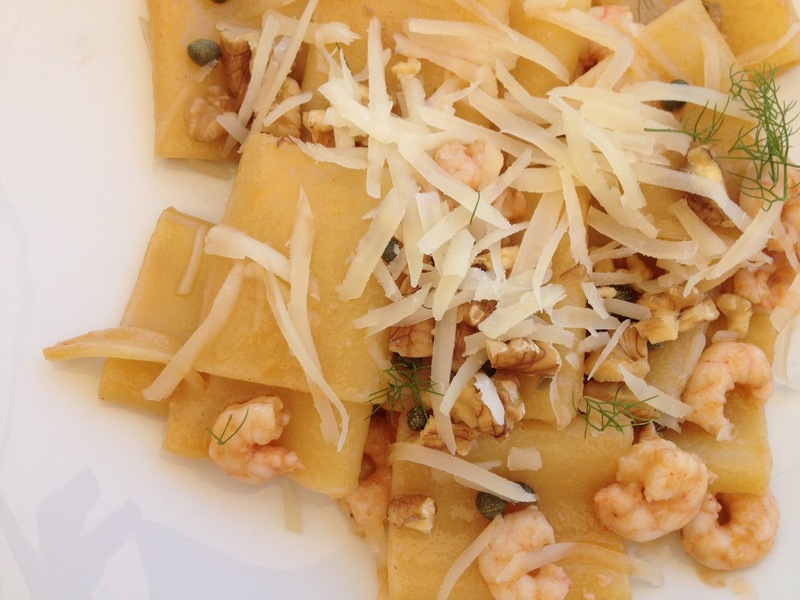 As we looked out onto the water, I enjoyed this homemade tube pasta with baby shrimps, walnuts, capers, and parmesan. After lunch and shopping, we got on the bus to Amalfi. 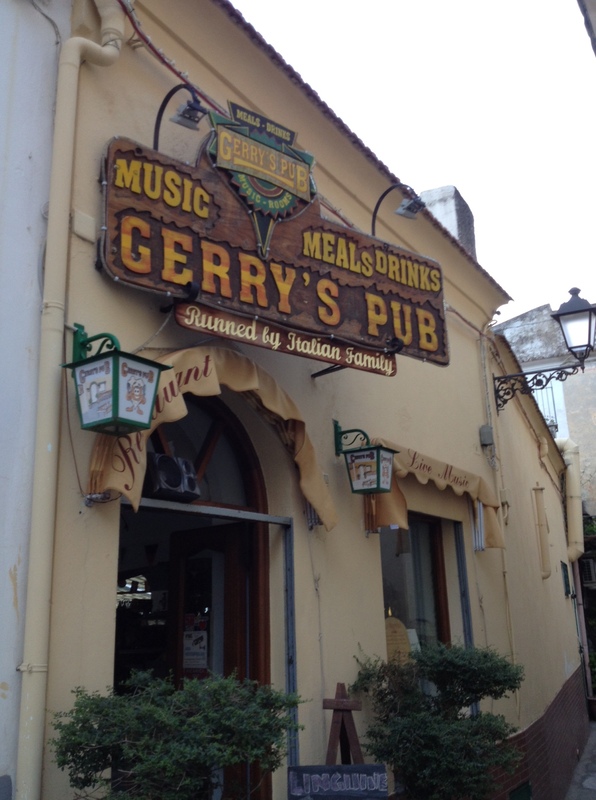 Through much Trip Advisor research, we decided to go to Gerry’s Pub for dinner. It was a long bus ride to the top (and we almost got lost since the sweet little man we asked thought we said “cherries” and tried to take us to a fruit stand), but the views and Gerry himself were worth it. 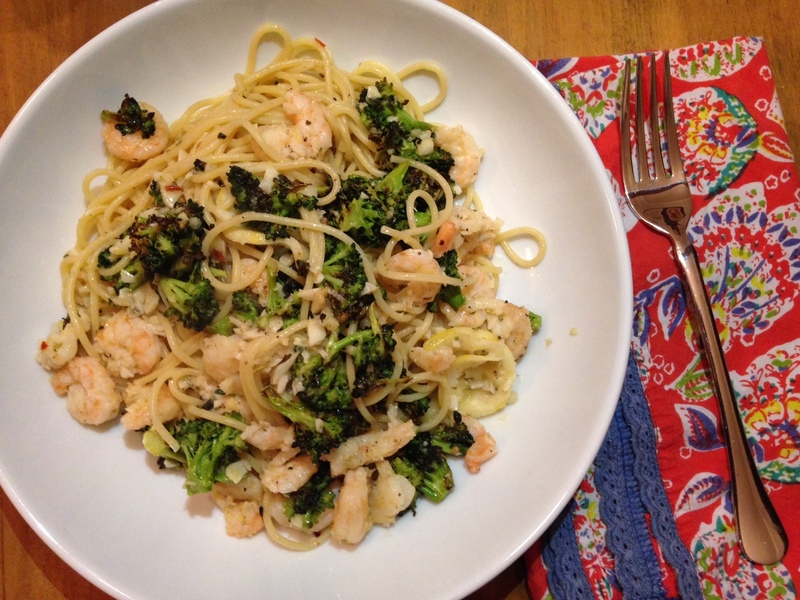 I had homemade seafood pasta. And then a seafood salad because I was still hungry. Gerry really liked us. He played Kenny Rogers and sang “Ruby” when we told him we were from the south. Apparently we didn’t want to leave because we missed our bus. Luckily we caught the last one and headed back to Sorrento. 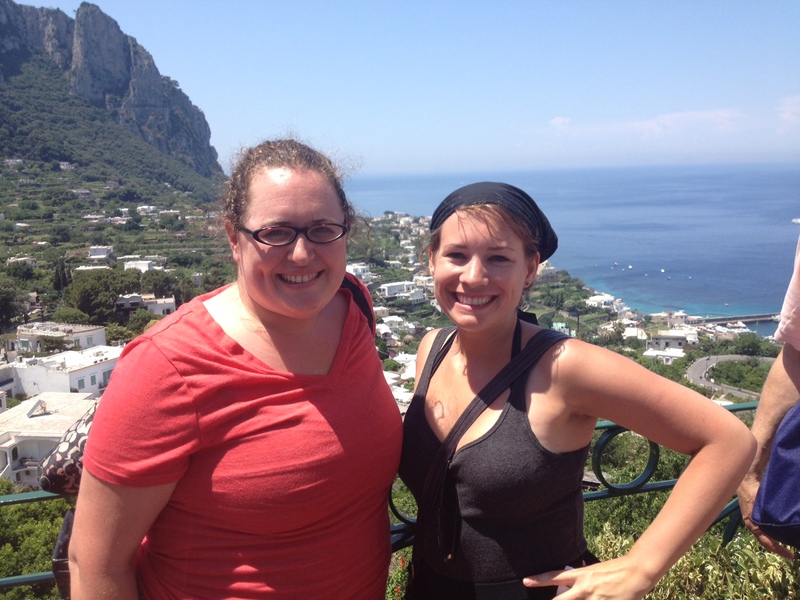 The next day we were off to the Isle of Capri! And I ain’t talking about some silly casino. After a boat ride around the island, we had a caprese salad and this was our view. 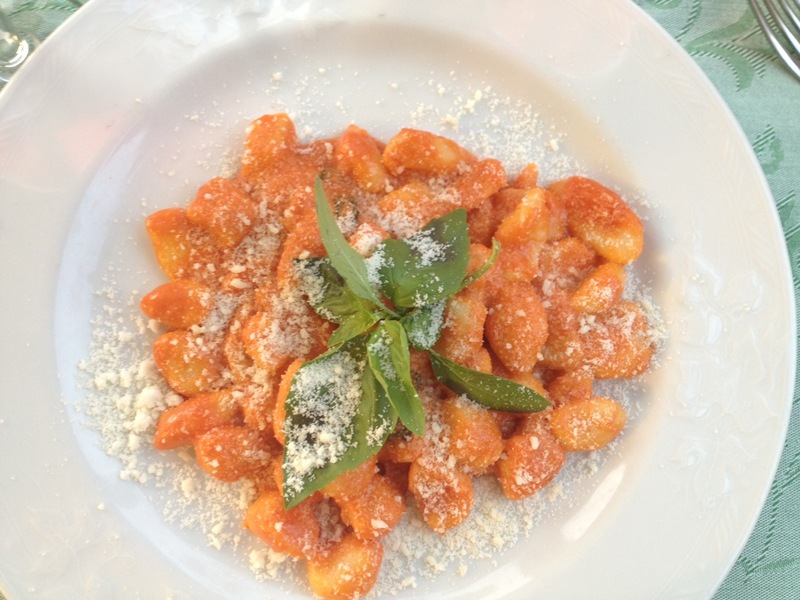 … and ended with the gnocchi in a mozzarella and tomato sauce. 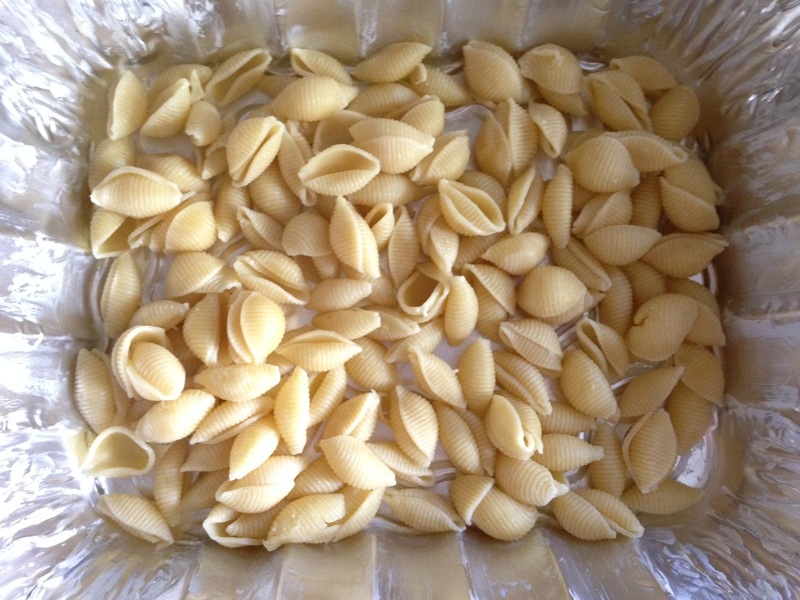 Those fluffly pasta pillows were a delightful last bite of Sorrento. 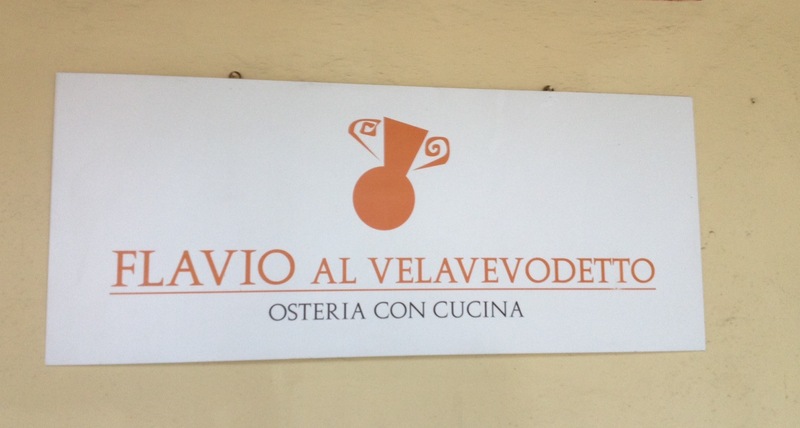 Back in Rome we found our favorite restaurant, Flavio Al Velavevodetto. 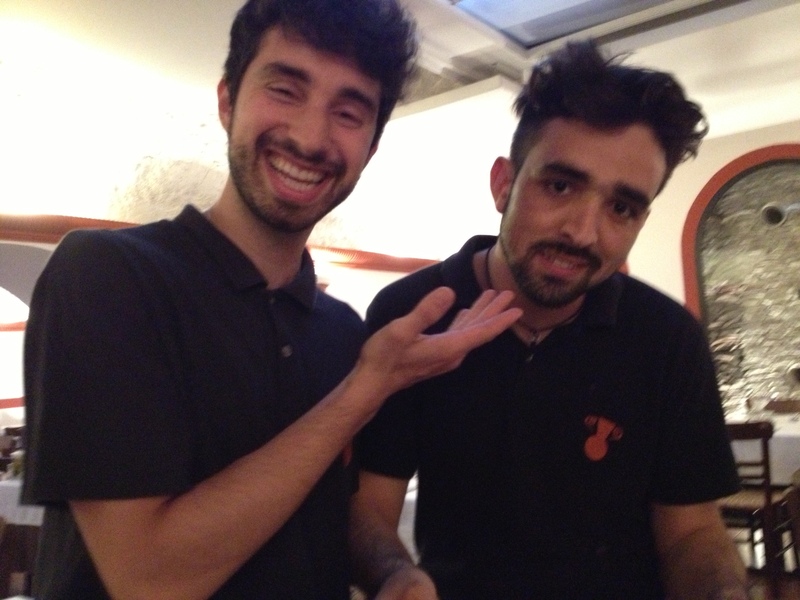 These servers, Simone and Sergio, made our dinner an authentic Italian experience. 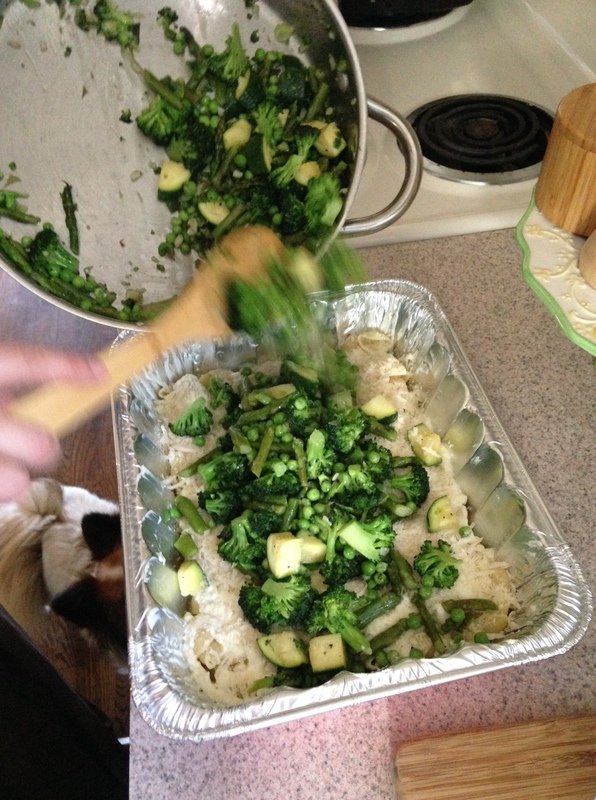 We started with zucchine scapece (marinated zucchini) which I am totally going to try to make. It was lightly fried and heavily flavored. 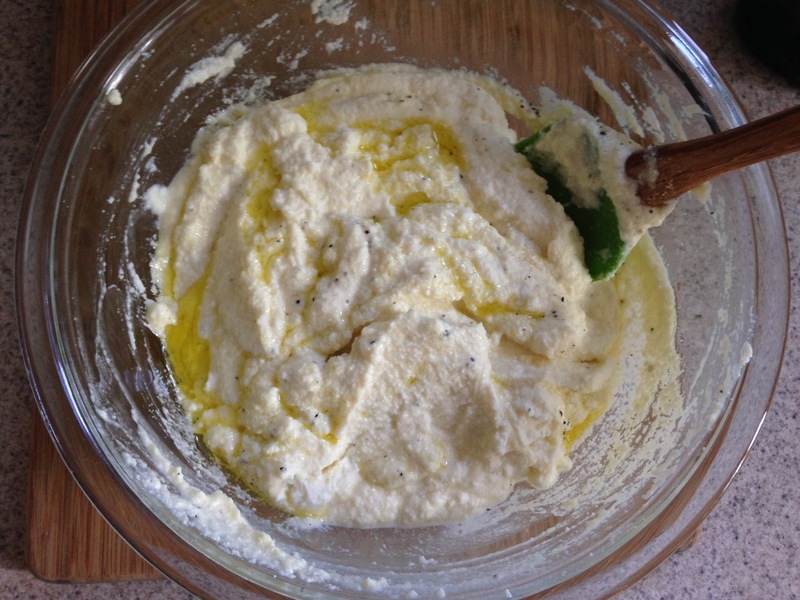 I am always amazed at the way something so simple can be so good. 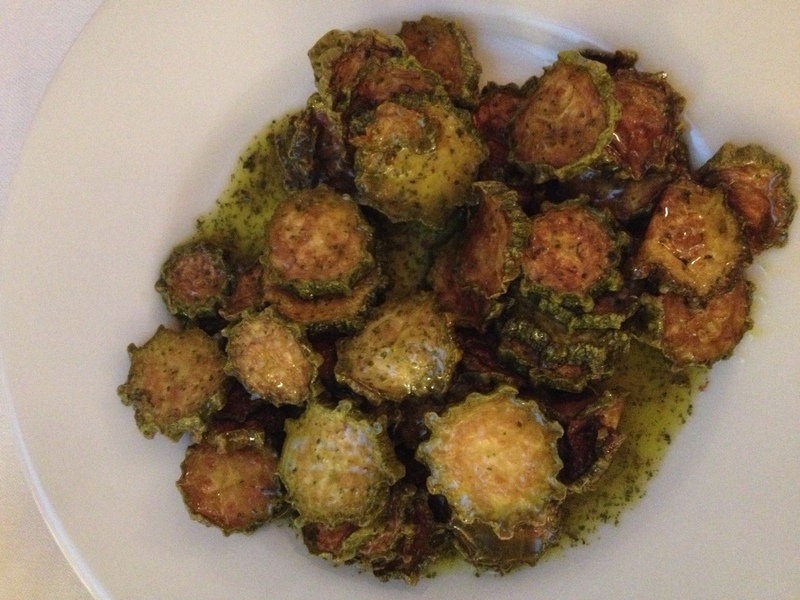 Then the pièce de résistance for me—handmade ravioli stuffed with ricotta in a cherry tomato sauce. 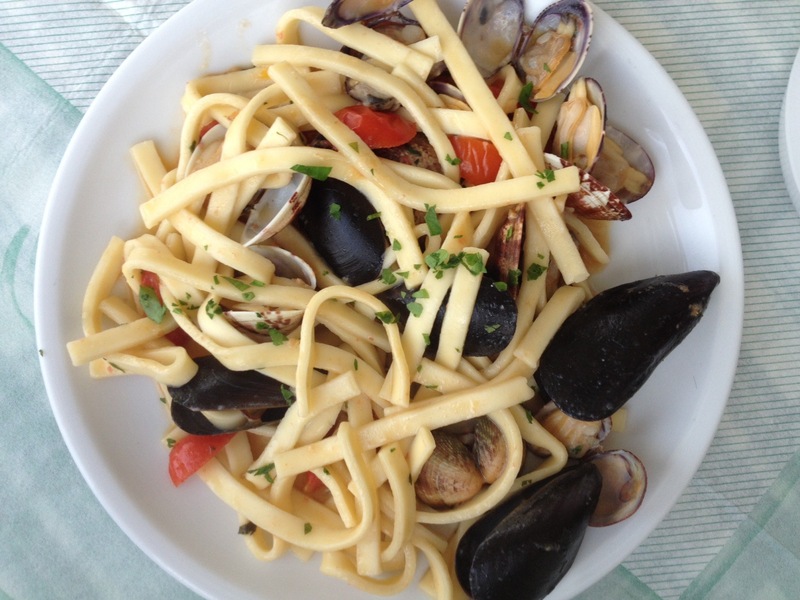 People, pasta in Italy does not get any better than this. 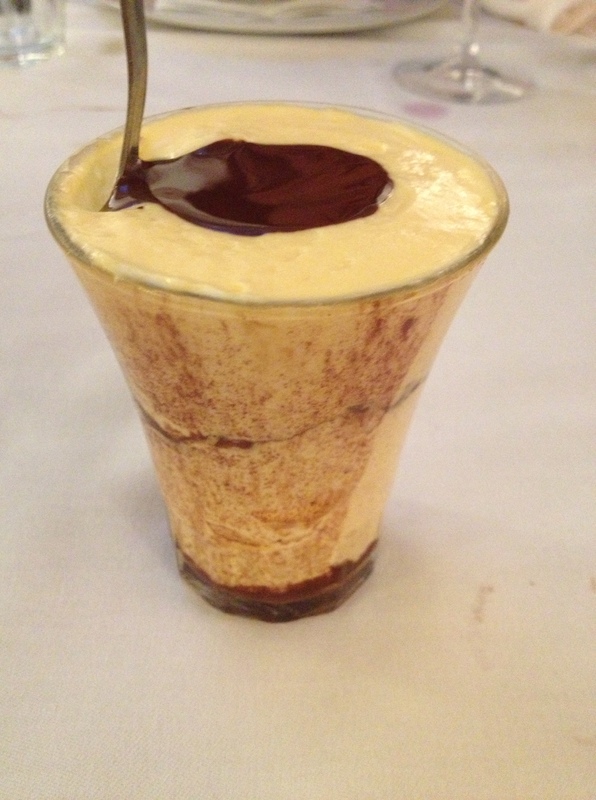 I finished dinner with a creamy tiramisù. 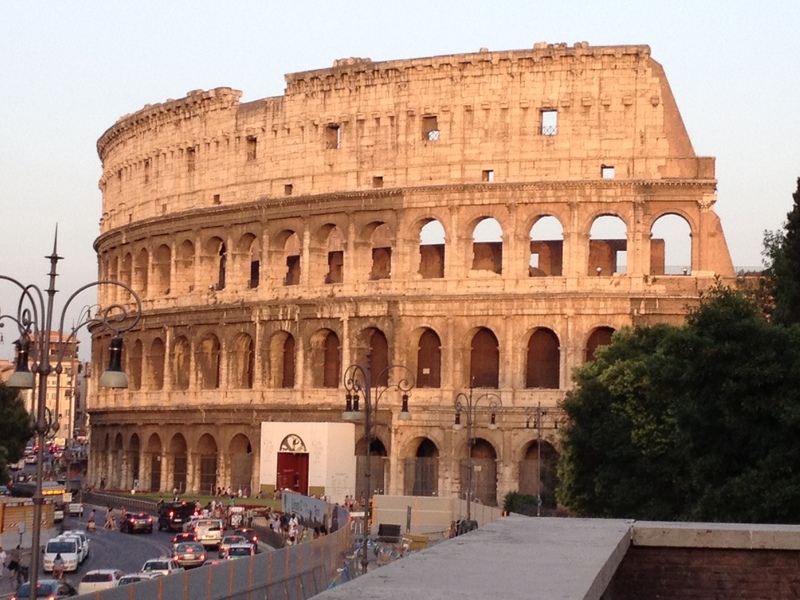 Our last day in Rome included many sites and two unforgettable meals. 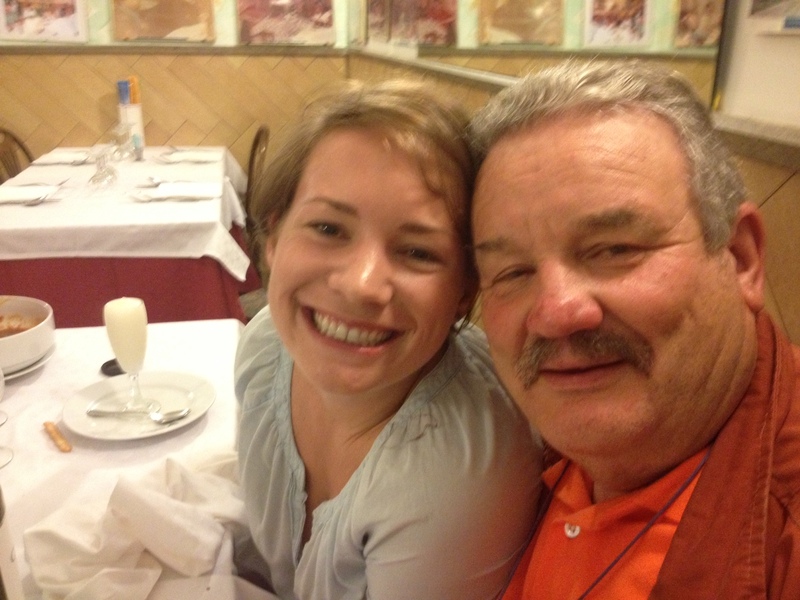 After wandering around the Trastevere neighborhood, we stumbled on a quaint lunch spot. 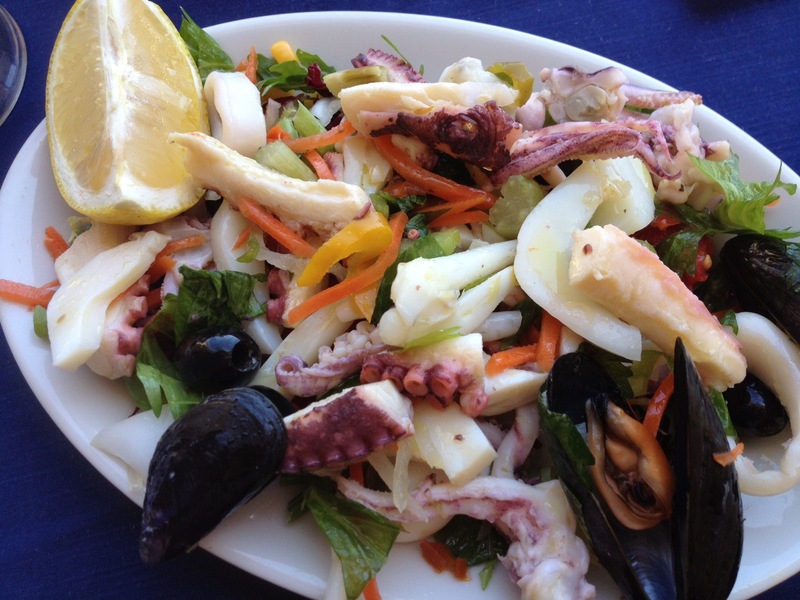 I started with yet another seafood salad. It was my last, but perhaps the best. 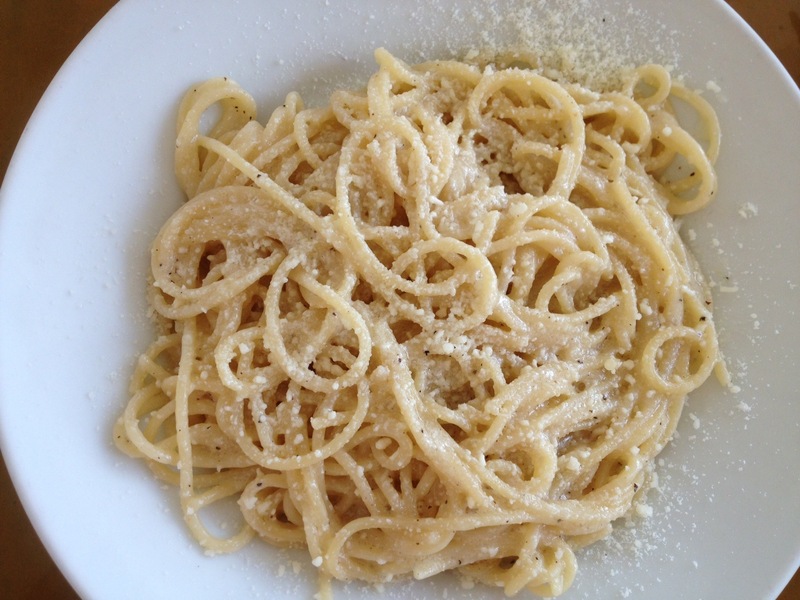 Next I polished off this plate of spagghetti cacio e pepe, which is essentially pasta with pecorino, oil, and pepper. You could add something, but why would you want to? A few hours later, we had seen some sights and were ready to eat again. 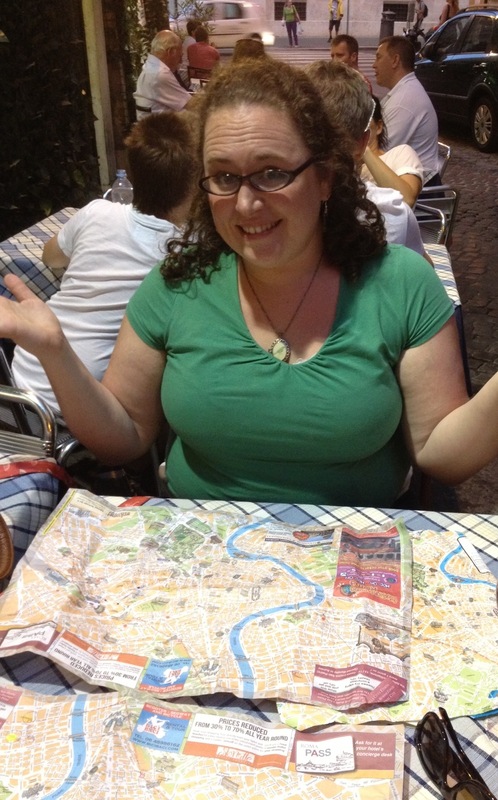 But even with three maps on the table we couldn’t figure out where to go for our last dinner in Rome. 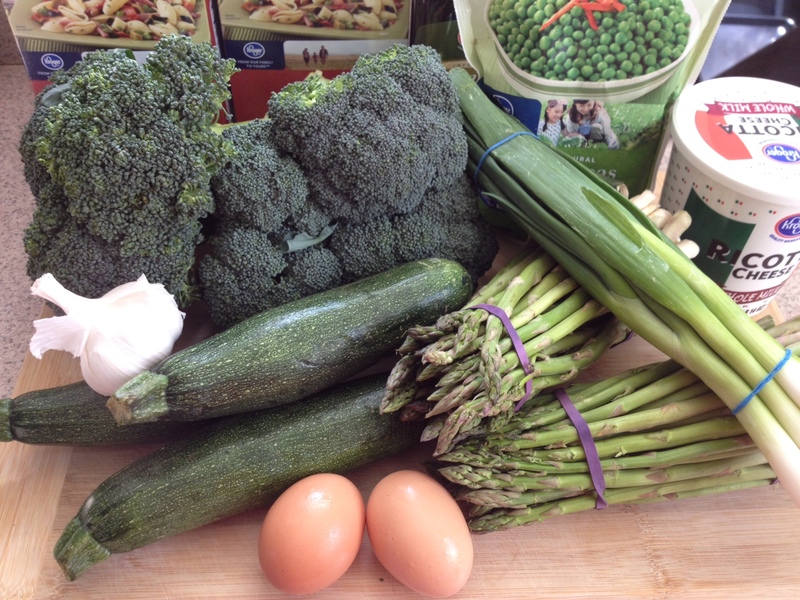 Since the menu changes daily, we had a completely different experience. But a fantastic one nonetheless. 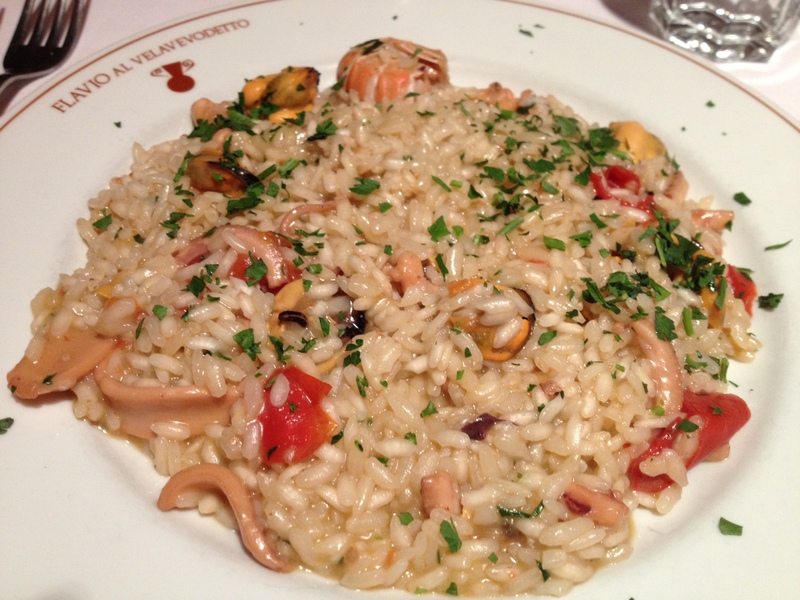 I enjoyed a hearty plate of seafood risotto. 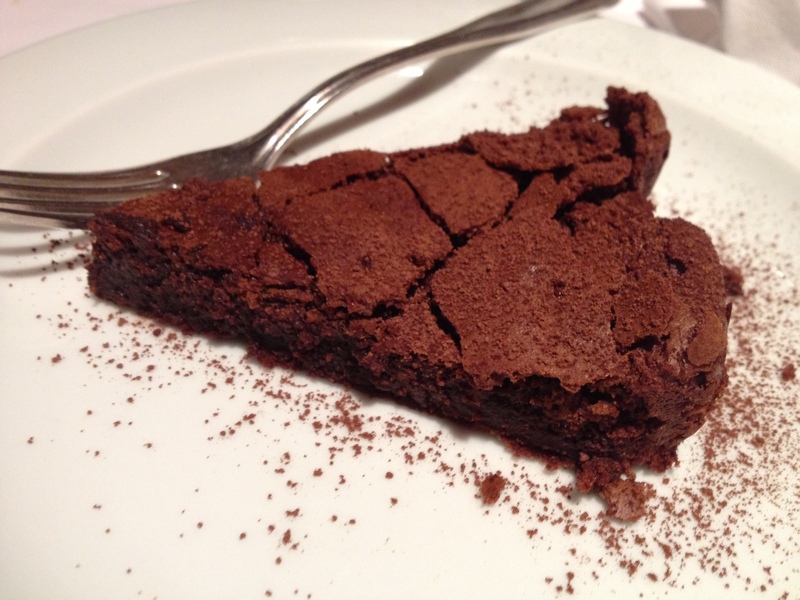 Followed by this chocolate torte. By the end of the night we had made friends with the table next to us and the entire staff. What a wonderful last supper. 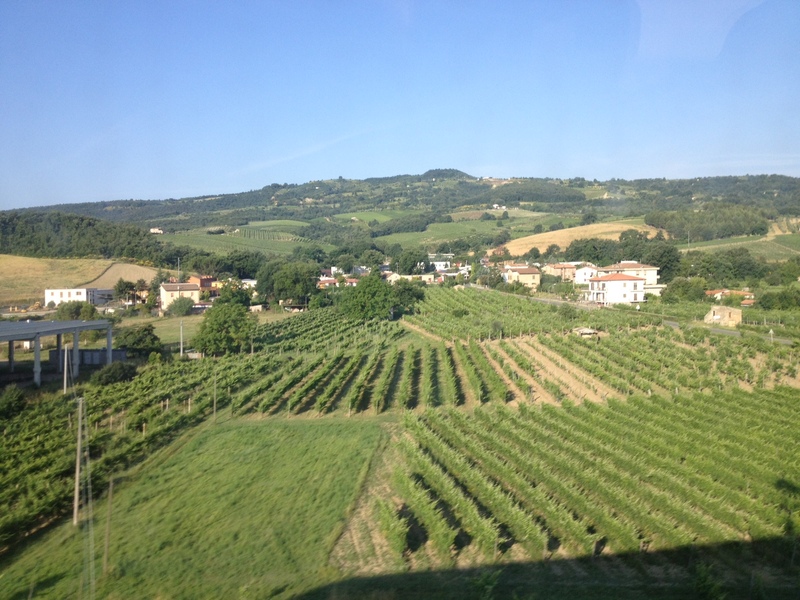 Ciao, Italia. Until we meet again! 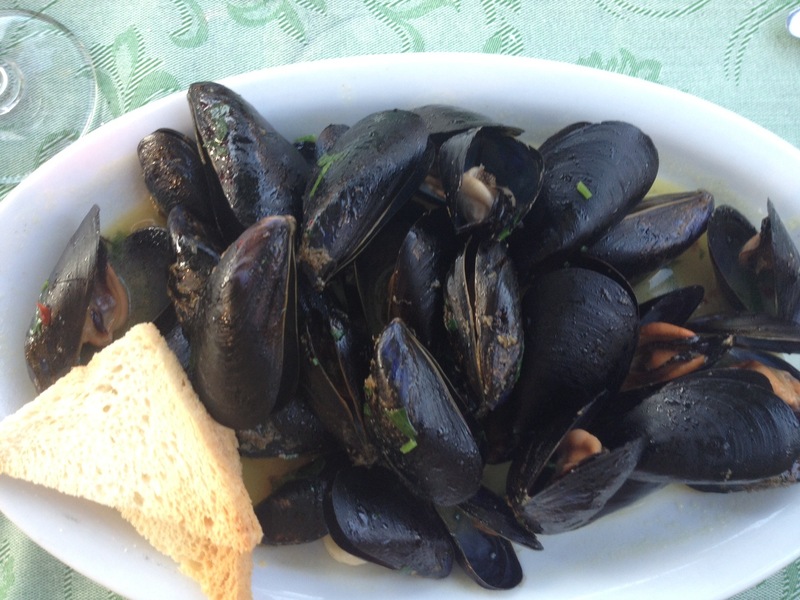 Categories: Culinary Travels, Friends, Restaurants, Uncategorized | Tags: amalfi, capri, caroline, florence, italy, pasta, positano, restaurants, rome, seafood, sorrento | Permalink.